I love red wine, do you? But the calories add up. Did you know we tend to eat and drink 96% more when we’re in a group of seven or more people? It’s easy to get caught up into social over-imbibing and we still have New Year celebrations ahead, yes? 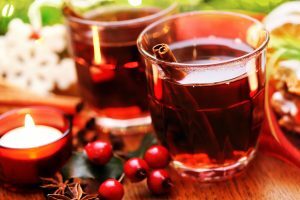 I’ve created a delicious, lower sugar mulled red wine recipe that is easy on your budget and your waistline. It is so rich and satisfying that you won’t want to drink too much. And once the wine is mulled for around 30 minutes, most of the alcohol cooks off. This Holiday Mulled Wine is delicious with a complex undertone of spices. The spices complement the fruity nature of the wine. Many recipes add sugar, but it’s really not necessary. Push cloves into orange peel. I have itty bitty fingers so I use a bamboo skewer to “pre-drill” the holes! Combine on stove-top and simmer 30 minutes. Serve and enjoy! Please share this with your friends who would like to enjoy this delicious and satisfying holiday beverage. May you share and cherish the simple joys in life and Happy New Year! Next post Meal Prep in a Snap!